After breakfast we will drive you through the desert to Jebel Burdah, some 30 km to the south. 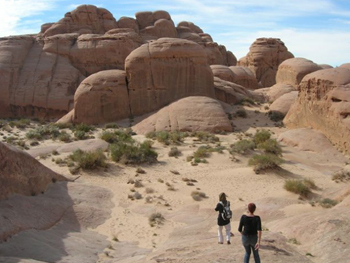 This is a magnificent drive through the far valleys of Wadi Rum and crossing the beautiful and lonely White Desert. You will have a guided hike to the top which usually takes about 2 hours. After hiking down again, you guide will start cooking your lunch and you can rest for about 2 hours. After the lunch we drive you for about 30 min to the White Desert where you can hike for 2 hours before we drive you back to the Bedouin Lifestyle Camp. From camp you can watch the beautiful sunset and spend the night enjoying bedouin music, songs, dinner and bedouin tea.